Karl Malone was selected as one of the NBA Top 50 Players of all-time and inducted into the Basketball Hall of Fame in 2010. In a career that has spanned over 15 years he has averaged 25 points per game and in 2000 became just the third player in history to pass the 30,000 point mark. On the front left tail is the Champion manufacturer’s tag size “52” with washing instructions. 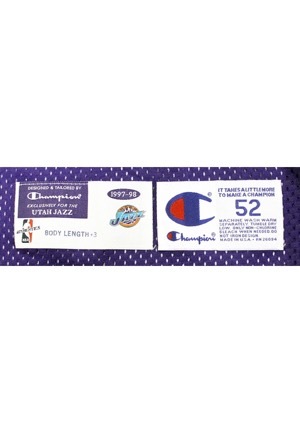 Adjacent is another Champion “Designed & Tailored by Champion Exclusively for the Utah Jazz 1997-98 BODY LENGTH +3" tag. 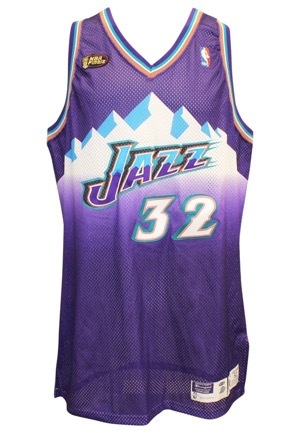 Across the front is "JAZZ" in purple and blue on white tackle twill. Below that and on the back is the player number "32" in white on copper on green triple tackle twill. 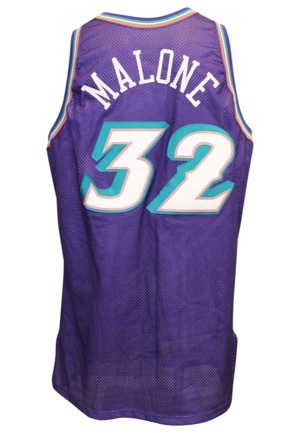 Across the back is the player name "MALONE" in white tackle twill. 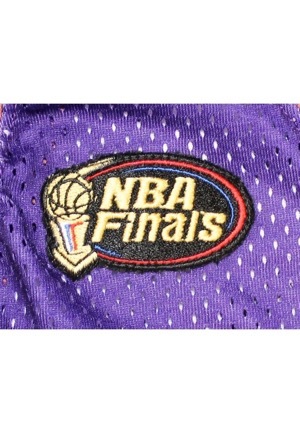 On the upper left chest is the official "NBA" embroidered logo and on the upper right chest is the official “NBA Finals” patch. This jersey is properly tagged, was presented to us as game-used patched and prepped for the NBA finals and in our opinion shows appropriate use.